Ericsson Consumer Lab’s TV and Media Report for 2017 paints a grim picture for linear TV and its providers. 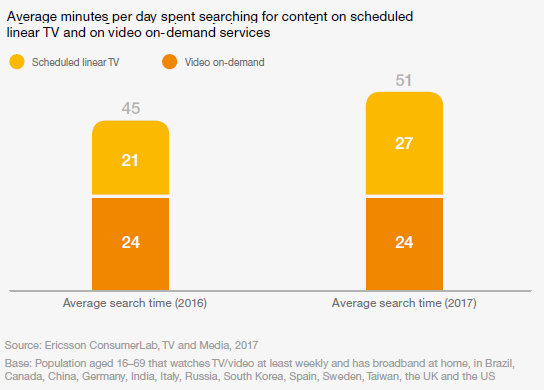 The shift toward on-demand viewing is accelerating, it is much easier to find something to watch on-demand, and consumers much prefer their SVOD services to linear scheduled television. Ericsson surveyed 20,000 people aged 16-69 in 13 countries including the US, Brazil, Germany, Russia, and Taiwan. All respondents had home broadband and watched TV at least once a week. 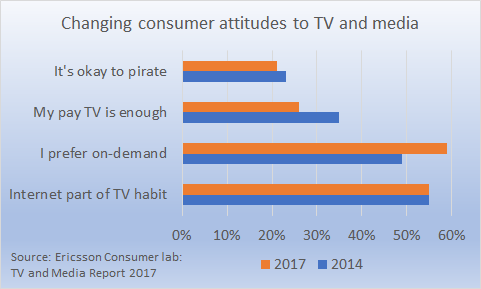 The Ericsson data shows that the number of consumers that consider the internet a natural part of their TV habits has not changed at all over the last four years. It remains at 55%. The number that considers video access as a major reason for getting faster internet has increased, from 45% to 49%. More dramatic is the shift toward on-demand viewing and away from linear. The average number of on-demand services used per household has increased from 1.6 in 2013 to 3.8 in 2017. Moreover, the data shows consumers are growing to love on-demand viewing. In 2014, 48% of survey participants agreed with the statement “I prefer on-demand over scheduled viewing.” In 2017, 59% said this. What’s more the shift toward on-demand viewing seems to be accelerating. In the five years between 2010 and 2014, the number of people preferring on-demand increased 10%. In the four years between 2014 and 2017, the increase was 11%. Conversely, in 2014, 35% of respondents agreed with the statement “My traditional TV service providers gives me all I need.” In 2017, 26% agreed with the statement. One bright point for content providers both traditional and digital is the shift in attitudes to illegal content access. In 2010, 24% agreed with the statement “If I can’t legally find the content I need, it’s okay to pirate.” The number saying that same in 2017 has fallen to 20%. Ericsson shows a startling difference between scheduled linear TV and on-demand access. On average, 55% of viewers say they cannot find anything to watch once a week or more in their on-demand video services. 83% say the same for scheduled linear TV. With all the attention pointed at search and discovery, we might expect consumers to be spending less time searching and more time viewing. That is certainly not the case according to Ericsson, at least for scheduled TV viewers. In 2016, the average minutes per day spent searching for content on scheduled linear TV was 21 minutes, and on-demand was 24 minutes. On average, then, consumers spend 45 minutes per day searching for content. In 2017, the average overall time spent searching for content increased 6 minutes, to 51 minutes a day. However, on-demand search time remained the same, 24 minutes, while scheduled linear TV search time increased to 27 minutes. The increase in search time on pay TV is a very surprising result since pay TV operators have been working hard to deploy better search and recommendations. For example, according to TiVo, in the U.S. market, the number of consumers using text search increased 3.8% to 49.7% between 2016 and 2017. 17.9% of pay TV subscribers say they receive content recommendations from their operator. As in years past, the number of US net promoters of SVOD is dramatically higher than for pay TV. Ericsson says in the US the net promoter score (NPS) for on-demand services is 58.~ The NPS for linear TV service providers is 39. What’s more, satisfaction in every category measured by Ericsson is higher for on-demand over linear TV services. Among the biggest differences were seen in installation and setup (84% on-demand satisfaction versus 62% linear TV,) price (81% versus 58%,) and a la carte offer (79% versus 56%.) The closest category was video (picture) quality where 84% of on-demand viewers were satisfied versus 80% of scheduled linear TV viewers. Ericsson data shows the switch to on-demand from linear TV viewing is accelerating. It is far easier for people to find something to watch on SVOD services than in pay TV. Consumers are far more satisfied with the SVOD services they use than pay TV. ~Net promoter score (NPS) is calculated as the difference between the number of people that would recommend a service and those that would not. So, if 58% would recommend a difference and 18% would not, NPS would 40. Higher NPS scores are better, lower scores are worse.